The art of fishing requires the use of specific equipment, gear, accessories, and even attire. Though the perfect fishing pole, a practical reel, and a sturdy fishing line are the most critical of fishing gear, there are certainly other forms of fishing tackle that are necessary to this challenging yet comforting outdoor sport. A well-stocked fishing tackle box plays a significant role in the sport of fishing, and is every bit as important as the rod and reel themselves. The basic contents of a tackle box will change and vary depending upon your level of experience, as well as the type of fish you are attempting to catch. Purchasing the best tackle box is an important step in the overall preparations you make for any type of fishing expedition. Like any other product on the market today, there is an abundant inventory of top rated fishing tackle boxes available for sale. Many of these specialized products can be bought online and present the average consumer with a variety of sizes, styles, and price ranges to choose from. Here are three of the best-rated models available that are sure to bring your fishing adventure to a whole new level of excitement and success. The Plano Angled Tackle System is an incredibly well designed tackle box that includes three Stow-Away utility boxes and a storage system that makes organization of your fishing items fast and simple, while also providing easy access to all the contents of your personal fishing tackle box. The practical design of this product allows you to fit everything you need for an extended stay on the water. It offers a separate compartment along the top to fit and hold your sunglasses, and a center compartment suitable for pliers, knives, and even snacks. Anglers are sure to find the utmost satisfaction with this efficient and very affordable product. The box is also equipped with two side pockets and three removable compartments that are ideal for storing sunscreen, bug sprays, and other supplies as well. This solid tackle box offers consumers the best in size, design, and durability. Priced reasonably, the Plano Angled Tackle System is a must have for anglers of all experience levels. 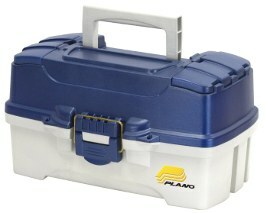 The Plano 4 is highly rated and utilizes the drawer tackle system. 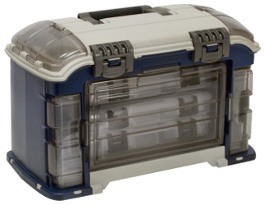 Referred to by many as the “mega-box”, this state of the art fishing tackle box has it all. The Plano 4-drawer tackle box offers a drop down front panel, with 4 very large sized drawers immediately behind it, and the box includes a very large additional compartment under its top lid that easily accommodates larger fishing items. This makes it ideal for saltwater fishing on a boat. Offering the consumer so much storage and extra space, this top of the line tackle box, with its limited lifetime warranty and very affordable price, is truly one of the best value tackle boxes for purchase today. It continuously receives high rankings and reviews by fishing enthusiasts. 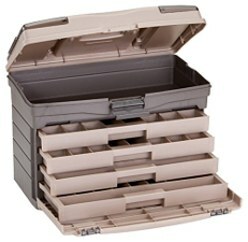 The Plano Molding 2, with its excellent consumer rating, is constructed with two cantilever trays offering 14-25 separate compartments, a brass latch for tight securing of the lid, a collapsible handle that makes carrying and storing the box quick and easy, and two additional top storage areas for somewhat larger fishing items. A tackle box recognized as one of the best for young anglers, the Plano Molding 2 is both versatile and functional and offers all the storage and organization any angler could ask for. Both practical and affordable, consumers just can’t go wrong with this amazing product. It’s a great product to start off with if you are new to the sport of fishing. When looking to purchase the best fishing tackle box on the market, keep in mind that an over-sized tackle box can be remarkably bulky and heavy and not practical for most anglers. Depending on how often you go fishing, the size and contents of your tackle box will vary. If you don’t fish often then surely you don’t want to be spending a whole lot of money on a product that will hardly ever get used. Be practical when making your purchase and look for such features as durability, water resistance, sufficient room to organize items, along with the capability to expand the tackle box. Another important factor to take into consideration is the manufacturer’s name, and the warranty that is offered with the product. With so many varied makes, models, and brands available online, you will be sure to find exactly what you’re looking for at an affordable price.